We, the clergy of the Western American Diocese of the Russian Orthodox Church Outside of Russia, standing before the relics of the Holy Hierarch John of Shanghai and San Francisco the Wonderworker, have gathered together in San Francisco on the Feast of the Icon of the Mother of God “Joy of All Who Sorrow” (24th October / 6th November) for three days of services, prayer and reflection. In addition to the Altar Feast of our Diocesan Cathedral, we are together marking three significant anniversaries: that of 100 years since the godless revolution in the Russian Fatherland; that of 10 years since the sacred restoration of unity within our beloved Russian Orthodox Church; and that of 25 years in the episcopacy of our Archpastor, His Eminence Archbishop Kyrill of San Francisco and Western America. One hundred years ago, in 1917, the bloody revolution of the Bolsheviks began, sending the Russian lands — and with them, much of the world — into a period of turmoil that would last more than seventy years. Already in 1905, the workers of darkness had organized revolutionary activity, trying to preoccupy Russia with a war in the Far East; but undeterred in their godlessness when the Empire yet stood strong, the forces of globalist oppression brought on the first World War, significantly threatening the worldly stability of the last major Orthodox Monarchy. So focused became Russia’s attention to her exterior enemies in those days, with a front that stretched a thousand miles, that the evil one took advantage of that trial, as well as of an apathy amongst men in all ranks and walks of life towards their zeal for the Faith, the Tsar and the Fatherland, to stir up the apostasy that led to the ‘October Revolution’ of 1917. Holy Russia was thus thrust into a dark, bloody fratricide. Never did the Lord’s people come more to terms with St. Paul’s words, the mystery of iniquity doth already work (2 Thess. 2:7), than in those terrible days. A Godly and devout Monarch, anointed by the Holy Spirit, had served as what the Apostle called ‘the Withholder’ (2 Thess. 2:6-7), restraining the encroaching powers of darkness; but with the people’s rebellion against God’s anointed, all manner of suffering ensued. Clergy were executed together with believing laity; sacred sites were defiled and demolished; and in many and various ways man strove to place his will above that of God. For decades, the entire span of Holy Russia became one enormous gulag, holding captive man’s flesh, his spirit, and attempting to destroy even the divine beauty of his immortal soul. Through those dark days certain goods were accomplished — the Patriarchate, long held at bay, was restored; and St. Tikhon, who at one time lived and prayed here in San Francisco, became the Patriarch of Moscow and All of Russia — nevertheless, the revolution in men’s hearts captivated society, creating a cloud of exiles, confessors and martyrs greater than that of any other period in human history. Patriarch St. Tikhon himself gained the glory of divine martyrdom, though not before recognizing that, for the preservation of the Church’s freedom, those senior bishops of the Russian Church who found themselves outside their homeland, should form a synod to see to the Church’s life abroad — which became, by God’s mercy, our beloved Russian Orthodox Church Outside of Russia. Thus it was that Russian Orthodox parishes sprang up wherever exiles from the travesties of revolution were found. How great, brethren, is the providence of God! Despite the evils of apostasy and secular humanism, the heterodox West received exiles who became missionaries; outcasts who became pastors and teachers and luminaries; and a Faith that, having been shunned by atheistic officials in the land of its flourishing, became a light to shine into the furthest reaches of the world. For the better part of a century, it was thus that God preserved our life. Though far from the Russian lands that had given our Church birth, the Russian Orthodox Church Outside of Russia lived ever in the consciousness of her spiritual connection to the suffering Russian territories. Through the litanies of the Divine Services, we cried out for the liberation of God’s peoples behind the Iron Curtain. The luminaries who had shone forth under the Communist yoke — among the first, the choir of the Holy New Martyrs and Confessors of the Russian Church, with the Holy Tsar-Martyr Nicholas and his family at its head — were heavenly intercessors for us on earth; and we always knew that, by their prayers and by the blood they and thousands of others had innocently offered, Russia would shake off the yoke of Communism and be free to witness the faith in peace once again. And lo, we have all been witness to that great miracle! Communism indeed fell, as all things that attempt to stand against God must ultimately do; and the Church in Russia, so long persecuted, driven into the catacombs, was set free. The peoples of Russia, having been deprived of an open faith in their God for seven decades, today freely quench their parched souls at the font of eternal life (cf. John 4:14), and a pious, sacramental culture once again flourishes in the Fatherland. So we continue to rejoice that ten years ago, on the Feast of the Lord’s Ascension in May 2007, the Russian Orthodox Church Outside of Russia and the Patriarchate of Moscow signed the “Act of Canonical Communion,” and the reconciliation of the two parts of the Russian Church was at long last effected. We recall the great pangs and trails that lead to this momentous occasion; the path towards reconciliation was a painful process for many. Yet the light of humility scattered the darkness of all human pride, and God once more moved His miraculous hand and made possible by His power what seemed impossible for men (cf. Luke 18:27). We bow before all those who could foresee this miracle during all the confusion leading up to this joyous union, especially the ever-memorable Patriarch Alexei II and the ever-memorable Metropolitan Laurus, whose tremendous spiritual works we especially honor this year. Yet our work is far from done, and our trials are far from over. Though freedom has come again to the God-preserved Russian lands, we still live without the God-appointed ‘Withholder’ — a pious Tsar — for which we continue to pray; and thus we continue to behold a world that lies ensnared in darkness. Wickedness floods the earth, and we in the Diaspora, like our brethren in Russia, are pressed from all sides. 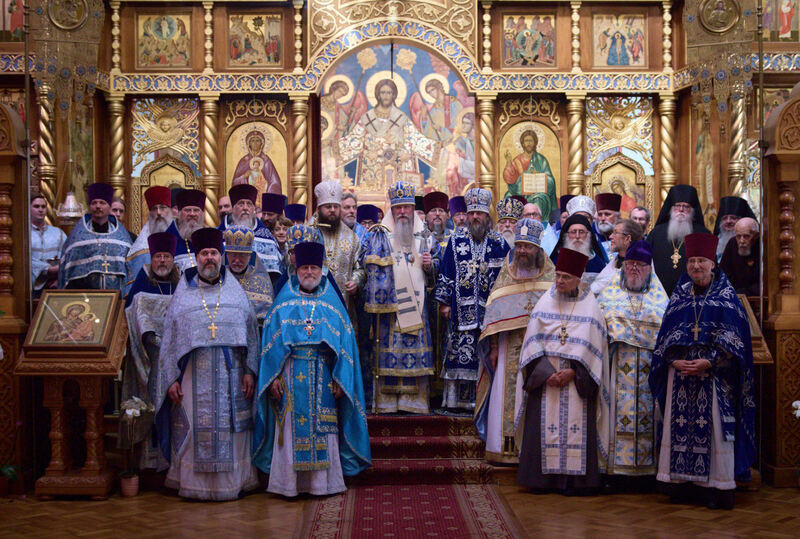 We as the clergy of the Russian Orthodox Church Outside of Russia have tremendous pastoral concerns to which we dedicate ourselves with full conviction: we stand together with all the faithful in a culture that must battle the impetus towards rebellion that flourishes too freely in society today — as if the world learned nothing from the lessons of Russia a century ago. We stand against encroaching secularism, against false science and humanist propaganda that is being forced upon our people and turning our societies upside down. We stand against a culture of godlessness and death, and for the holiness of that life offered only by Christ, which the world needs desperately to receive. 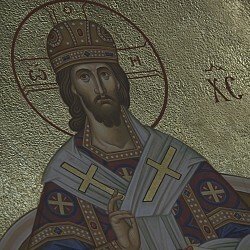 And we commit ourselves to suffering together with our flock; for we know that as we in the Diaspora, like the Church within Russia, entrust ourselves to the Holy Spirit to resist the tide of evil, to keep our culture’s sovereignty, moral freedom and ground ripe for thriving in the True Faith, so will we be slandered and persecuted in the world. We stand in full solidarity with our brethren in Russia as that nation undergoes this slander so regularly in our country today; reminding our brethren there as we remind our own flock, of the words of our common Savior: If you were of the world, the world would love its own. But I have chosen you out of the world, therefore the world hates you. (John 15:19). But we never cease to rejoice, for we hear the words of the same Lord: Be of good cheer: I have overcome the world! (John 16:33). We acknowledge with gratitude the pastoral efforts of our Ruling Bishop, His Eminence Archbishop Kyrill of San Francisco and Western America, who has served in the episcopal office for the last 25 years. We recognize the stability that has been provided to our Diocese through the long-standing presence, prayers and wisdom of His Eminence; and because we know his cross is heavy, we pray that God will grant to our Archpastor many years in this life and a blessed reward in the age to come. Beloved flock: we are a minority in this world. In it, we have no abiding city (Heb. 13:14). But we call up all of you to live without fear: for where sin abounded, grace did abound much more (Rom. 5:20). We have beheld wonders and miracles as we have watched God overcome the dark forces of evil in our day; and we must never lose hope that He reigns supreme and will not let us be lost to darkness in the days ahead. God is love (1 John 4:8), and we receive from the Holy Royal Martyrs and all the New Martyrs and Confessors of Russia, together with the testimony of our sacred Hierarchs of the Church Abroad and the unyielding testimony of all the saints, the witness of that love. May it be the source of our strength and support, that individually and collectively as a Diocese, we may grow so close to Christ our Savior that we can cry out with St. Paul: I live; yet not I, but Christ liveth in me (Gal. 2:20). The Resolution of the Autumn Clergy Pastoral Conference may be printed here.